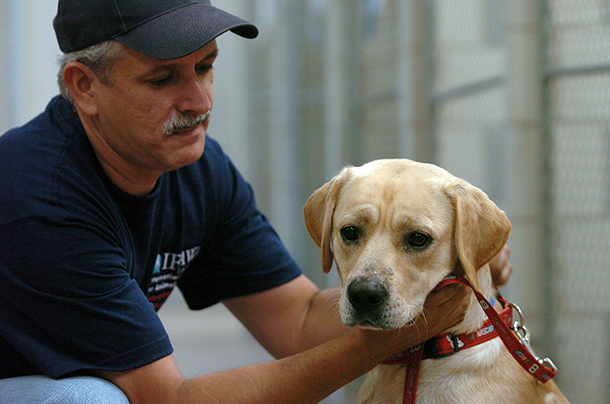 Ten years ago I was leading IFAW’s Animal Rescue efforts when Hurricane Katrina made landfall. I should be able to quote endless statistics about the number of animals affected and the thousands of victims IFAW helped rescue. I should be able to explain exactly what happened, who was there, and what we did on each of those fateful days. For me, like everyone who was there, the days and weeks after Hurricane Katrina are an adrenaline fueled blur of tragedies and small triumphs. I remember the gut-wrenching calls from boat crews who were just outside the city and ready to respond, but were held back because “animal rescuers” were not considered essential. I remember the glow from a long line of rescue vehicles waiting to unload hundreds of emaciated, exhausted animals each evening. I remember the heat. The chaos. The confusion. The relief each time a truckload of rescued animals left for new homes. And most of all, I remember one woman who changed my perspective forever. She had lost everything in the flood. No home. No clothes. No way to shelter and feed her animals. When I told her IFAW could help, her eyes brightened and I saw the first hint of a smile begin to emerge. I smiled back. After all, I was leading an extraordinary IFAW team. And then, just as quickly, her eyes darkened. She locked onto me with a gaze that somehow conveyed how remarkably strong, and yet how close to the breaking point she truly was. “We’ve lost everything but our animals. I’ve heard endless promises, but everyone else has let us down. Why should I trust you now?” she asked. The look in her eyes and the quiet power of her voice forced me to stop and truly understand the true magnitude of our responsibility. I’d been involved in countless rescues. I helped move truckload after truckload of cats, dogs, goats, pigs and an entire Noah’s ark of refugees. I was working alongside some of the best animal rescuers in the world and despite all the odds, we were saving animals. I now realize I was running on a heady mix of adrenaline and exhaustion. I had insulated myself from the heartbreak around me by focusing on my ability to DO SOMETHING. I thought I was able to help, because I’d invested fifteen years of my life fighting for animals around the world. I had rescued animals in disasters. I’d faced off against seal hunters, confronted dog meat dealers and exposed corrupt politicians. I cared deeply about saving animals and people, but at that moment, I was also a bit full of myself. Her question reminded me that I was just one small part of a team, which was part of IFAW, which was part of a movement supported by millions of caring people worldwide. But she could trust us. Katrina overwhelmed the official systems, but it also set a new standard for what can be accomplished when we set aside our differences and unite behind a common goal. The levees broke and a flood of individual donations and volunteers allowed IFAW and other groups to overcome unprecedented challenges. Katrina exposed our weaknesses. It sharpened our strengths. And it inspired a new way of working together that’s already saved countless more lives around the world. There are plenty of numbers to recall. Approximately 250,000 animals displaced or killed. 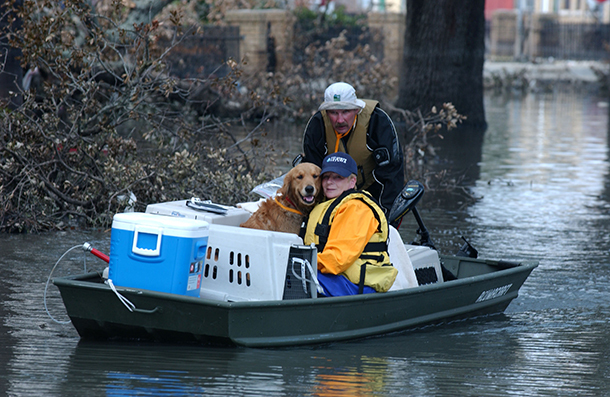 At least 1,200 rescues at the IFAW supported Louisiana State University shelter. Countless thousands more at shelters across the region. Yet for me, all I recall is one. She could trust us because IFAW is supported by people like you and a global animal protection movement that is united like never before. We still have a long way to go, but together, we are turning the tide. 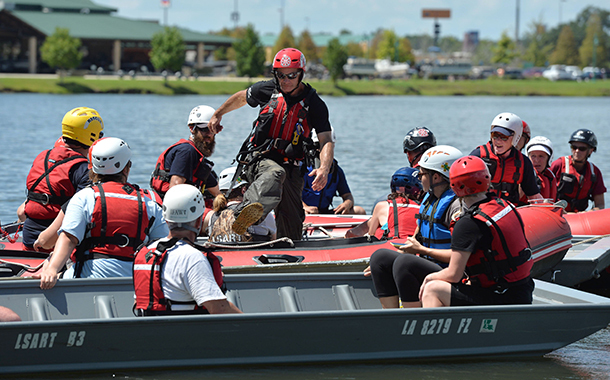 PS: To see how far we’ve come, be sure to read our next blog post from the Disaster Training Boot Camp currently underway outside of New Orleans. IFAW, other animal groups and Federal Officials are united in our efforts to ensure helping hands are always ready to reach animals in need.